Is there anything that makes you go Whoopie! more than chocolate cake? Nope, atleast not for me! Ok, I lied, maybe a vacation would do me some good, but that's not in the cards right now, so chocolate cake it is. But this is no ordinary chocolate cake. This is a Red Velvet Cookies and Cream Whoopie Pie. I say chocolate because this cake, has a bit more chocolate flavor than most other red velvet cakes. Red velvet is essentially a butter/vanilla cake with a bit of cocoa powder added to it. I took it a bit and added more cocoa powder. So this is essentially a dark red velvet cake sandwiching a cookies and cream speckled marshmallow cream cheese filling. Uh, yes. After our trip to Austin, I gained a lot of inspiration. The food culture in this town is eclectic, fun and passionate. We ate a lot while we were there and between the awesome local chains, farmers markets and specialty shops, I was excited to get back into the kitchen and see where this town has taken me. I was especially excited about the Kolaches. I thought after living in NYC, there wasn't an international pastry I haven't heard of, but I was totally wrong. Kolaches are traditionally Czech and have a long heritage in Texas. You can find them in most bakeries and donut shops there. And they are delicious. I have never seen or heard of a Kolache in NYC! Though when I got back I googled it and apparently there are 2 shops in Brooklyn that specializes in them! Who knew! I cannot vouch for them, but the ones in Texas are good. So in hopes of fusing the idea of Kolaches into my world, I'm making Apple Cream Cheese Kolaches. 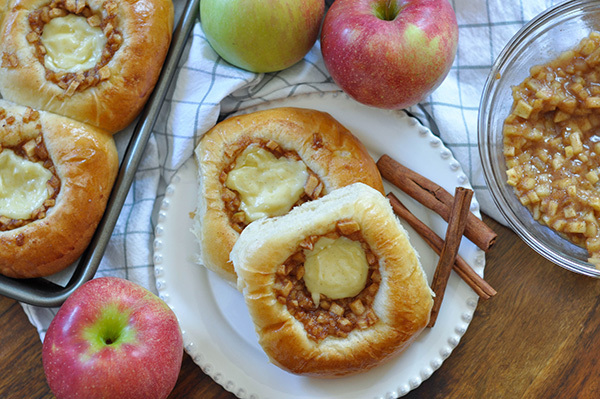 I made them with a dough I'm more familiar with, milk bread and added a burst of fall flavors.